In Europe last year, two iconic brands in our industry, Labelexpo and FINAT, marked the 25th anniversary of their partnership. As 2016 was a non-Labelexpo year in our part of the world, this called for a celebration at the 2017 edition of Labelexpo Europe in Brussels, from 25-28 September. The Labelexpo shows, organised by Tarsus, are biennial exhibitions providing a showcase for new label machinery, products and technology and offering a ‘one-stop-shop’ for companies to do business, to network, and, to learn about the latest news on products, markets, opportunities and innovations. The new and modern design of the FINAT booth was positively received. With more space to network, the main features were a recycling desk, the hall of fame, a meeting room available to FINAT members, possibility to charge the batteries of your mobile devices, the latest statistical data and various educational and technical publications, and of course the FINAT team whom was present together with industry experts to answer all questions! View below the interview of FINAT President Chris Ellison and Managing Director of Tarsus Lisa Milburn on the successful partnership at Labelexpo and the strengths and future perspectives of the collaboration. View press releases from our supplier members on their presence at Labelexpo here. A lot has changed since Tarsus’ predecessor (the Labelex/Cowise Group) and FINAT signed their first Labelexpo agreement in 1991, which was renewed in 1994, 1999, 2004 and 2010. The agreement is up for its fifth renewal towards the end of this decade. Meanwhile, similar partnerships have been developed with other regional associations, such as TLMI (Labelexpo Americas, Chicago), LMAI (Labelexpo India, New Delhi) and, most recently PEIAC Labels (Labelexpo Asia, Shanghai). The agreement, which became effective on 1 January 2011, extends the partnership till December 2019, and links FINAT to all Labelexpo events in Europe and South East Asia. The continuation of a joint Labelexpo Advisory Board as a ‘sounding board’ to evaluate each edition of the shows and review forthcoming editions. In spite of difficult economic circumstances at the turn of the decade, Labelexpo Europe has gone from strength to strength, and the upcoming edition now encompasses not less than nine halls -- excluding Hall 10 which, as in 2015, will be the venue for the Global Label Industry Awards night. From drupa’s ‘little niece’ in the early years, Labelexpo Europe has matured into the world’s leading showcase event for the labels and package printing industry, with an expected exhibition floor space in 2017 of over 35,000 m2; more than 700 exhibitors from 40 countries worldwide; and over 36 thousand visitors. The transformation of Labelexpo Europe, from a niche event dedicated to the rapidly emerging self-adhesive labelling technology, to an established global trade show covering a broader spectrum of labels and package printing and converting technology, also reflects the changing shape of the industry. As one of the relatively youngest technologies in product branding and identification, introduced in Europe in the post-war period, the self-adhesive label industry has, in its history, mastered a wide range of printing technologies and printing substrates. Most recently, it has become the front runner in the adoption of digital printing technology. From this strong, high-end technology knowledge base, it was well positioned to embrace other areas of the package printing domain such as flexible packaging, shrink sleeves, IML and even cartons. Undoubtedly, as the embedded ‘knowledge provider’ to the industry, the Labelexpo Group (including the magazine Labels & Labeling, the Label Academy, and numerous other industry publications) have been instrumental in achieving this transformation by delivering content, and enabling the smooth adoption of new technology and solutions within the label industry. With this healthy background, the risk of complacency is a risk. With the growing size and widening scope of this flagship event, its complexity in terms of logistics, facility management, visitor convenience, and responsiveness to market demands is also increasing. For this reason, a couple of years ago, Labelexpo and FINAT expanded their so-called Labelexpo Advisory Board (LAB), which initially consisted of management representatives from Labelexpo and Board members from FINAT, to include a cross-section of exhibiting suppliers. Since this new advisory board structure was installed, the ‘LAB’ has served as the sounding-board and trusted ‘eyes and ears’ of the European Labelexpo exhibitor and visitor community, to ensure continuous improvement. In the absence of alternatives for the time being, considerable focus in recent years has been put on achieving improvements in the existing venue. For the 2017 edition, the first results of a long-term investment programme by Brussels Expo should become visible. 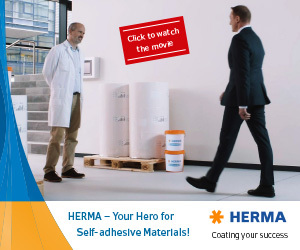 Ralf Drache, Director of Sales and Marketing at HERMA and FINAT Board Liaison in the Labelexpo Advisory Board, comments: ’Inspiring and supporting our industry is the greatest ambition of Labelexpo Europe. For many years now, the LAB has focused on continuous improvement of this trendsetting trade show. Feedback and the expectations of both visitors and exhibitors, combined with the vision and experience of the Labelexpo Europe organization, initiate a dynamic process of creating new measures and developing ideas… It’s an excellent example how FINAT represent the interests of its members -- and the entire label industry."